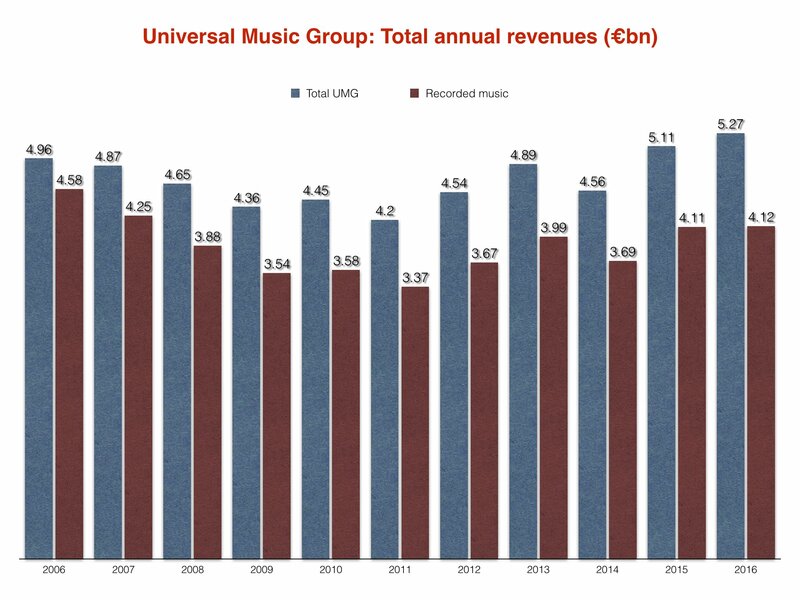 Universal Music Group had its best ever fiscal performance under Vivendi ownership in 2016, thanks to a small increase in total revenues – despite download sales crashing by €266m ($294m). 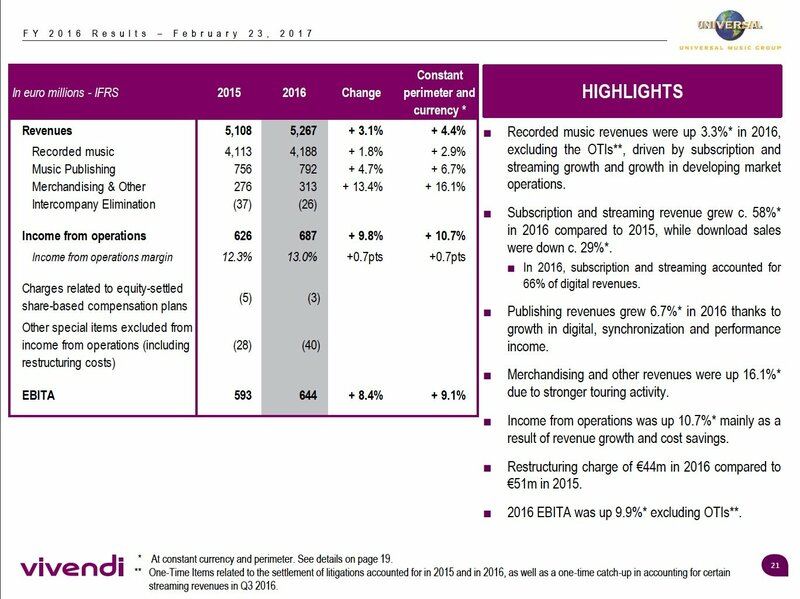 New Vivendi figures show that across recorded music, publishing and its other activities, UMG’s total revenues rose by €159m ($176m) on 2015, up 3.1% from €5.108bn ($5.65bn) to €5.267bn ($5.83bn) – despite a slightly disadvantageous Euro conversion rate. 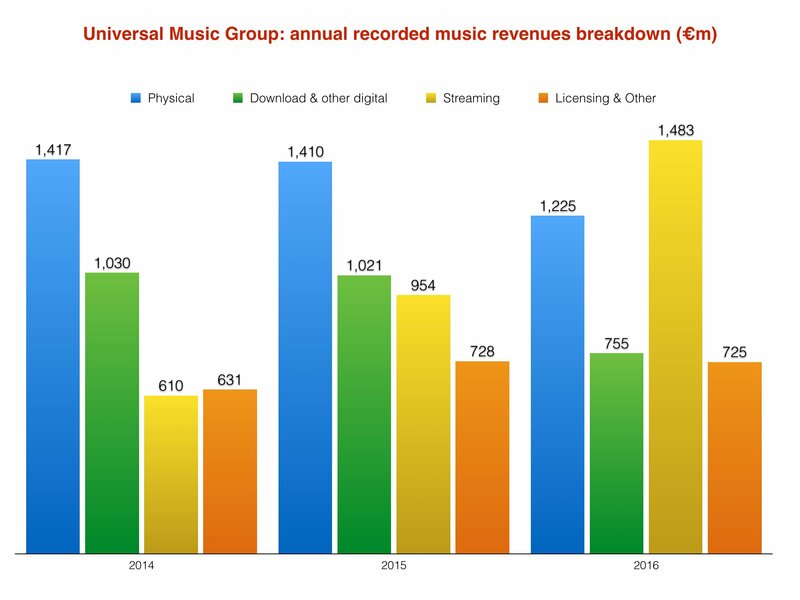 Within that overall figure, recorded music revenues hit €4.188bn ($4.63bn), up 1.8% (or €75m/$83m) on the €4.113bn ($4.55bn) posted the previous year. 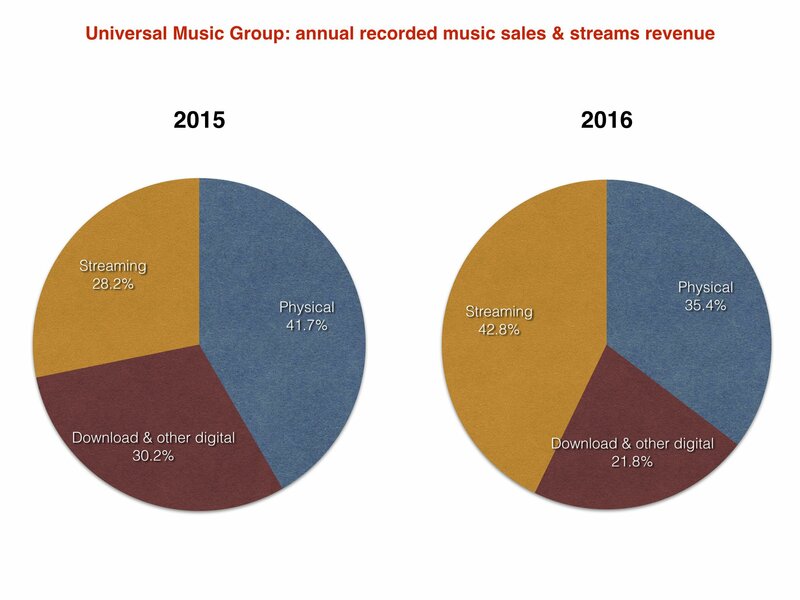 For the first time in history, physical music sales were beaten by streaming (inclusive of ad-funded and subscription) at the company. Recorded music revenues from the likes of Spotify and Apple Music jumped to €1.483bn ($1.64bn) in 2016, up 55.5% on the €954m ($1.06bn) posted in 2015. (According to Vivendi, this figure was up 58% at constant currency/perimeter). Just for fun: that 2016 streaming figure equates to around €124m ($137m) a month, €28.5m ($32m) a week and €4.1m ($4.5m) a day. 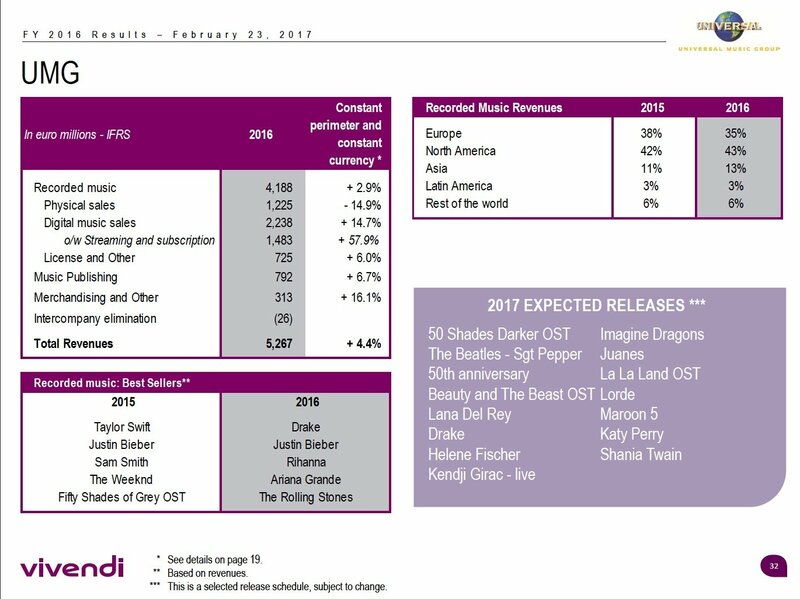 Physical music sales, meanwhile, fell 13.1% year-on-year – down to €1.225bn ($1.36bn) in 2016 from €1.410bn ($1.56bn) in 2015. As for download? Typically ugly scenes. 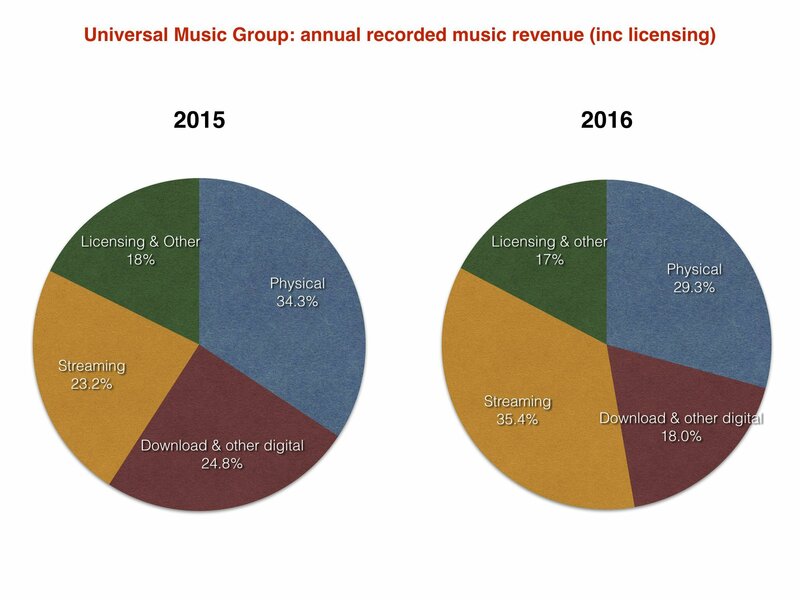 The iTunes-led format (along with ‘other digital’ formats like ringtones) generated €755m ($835m) in recorded music revenues in 2016. That represented a 26.1% fall on the €1.021bn ($1.13bn) generated by downloads in the prior year. Universal Music’s biggest selling artists in the year (in revenue terms) were: Drake, Justin Bieber, Rihanna, Ariana Grande and The Rolling Stones (pictured). Universal Music Group became 100% owned by Vivendi in February 2006.